ELKTON, Md. – It may take a village to raise a child, but for an institution of higher education, it takes the dedication and support of an entire county. For the past five decades, the residents of Cecil County have been intensively supportive of Cecil College and its growth. This dedication was exemplified 15 years ago with the commitment by local, county and state officials to enable Cecil College to offer state-of-the-art programs in Elkton by agreeing to build new facilities. “More than any of our other locations, this building is emblematic of all we aspire to become: ever-growing with programs that meet a variety of learners’ needs and interests, and far-reaching to create a regional center of achievement for students seeking college credit or continuing education. Elkton Station is home to our collective partnerships with the public schools, colleges, universities and all other groups that create a clear pathway to earning advanced degrees right here in Cecil County,” said former Cecil College President W. Stephen Pannill, Ed.D., on April 17, 2005, during the dedication of the recently completed Elkton Station. Back at the turn of this century, Cecil College was in desperate need of modern education and training facilities to service the Elkton region of the county. What came out of the multitude of discussions was the vision of Grimm and Parker Architects from Calverton, Maryland, that is today’s Elkton Station. Today’s facility features 52,000 square feet spread over three floors that include 20 classrooms, three computer labs, a Performing Arts Hall, and four studios for ceramics, music, dance and the arts. When this $12.5 million complex opened in January 2005, it was hoped to shine as a beacon of opportunity for Cecil County. The faculty, staff, and administration did not disappoint as Elkton Station is now a focal point of economic growth and stability, workforce development, and lifestyle enhancement matched by no other in the tri-state region. But to know where we are going, we must remember from where we came. Looking back, the future wasn’t too bright in 2000. The former Elkton Center for Adult Education, housed in a renovated elementary school from built in the 1940s, was deemed inefficient for serving adults students or attracting businesses for training programs. It was impossible to update the building’s infrastructure to meet the needs of modern technology, there was asbestos and lead-based paint throughout, and both the electrical and plumbing systems violated city and county codes. Along with being cited for violations of the Americans with Disabilities Act (ADA), the two structures the college had occupied for 20 years had reached its end of viability. The two structures, which totaled 18,000 square feet of learning space, were demolished and followed by a groundbreaking ceremony on Aug. 27, 2003. Today, Elkton Station stands at the corner of Bow Street and Railroad Avenue as a symbol of hope and opportunity. Elkton Station serves as the home for Career and Community Education, providing leadership and training in workforce development and lifelong learning programs. Students’ learning experiences are enhanced through the technology and ultra-modern studios explicitly designed for dance, music, theater, and ceramics. The Performing Arts Hall and Elkton Station Gallery host student performances and artwork. 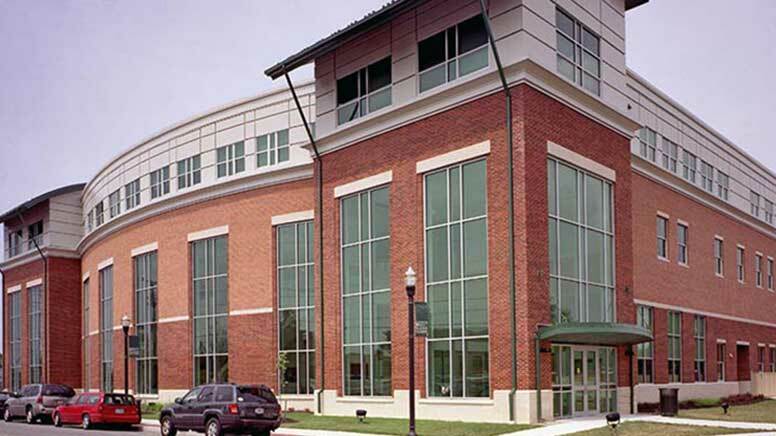 Located across the street from Union Hospital, students can take advantage of the numerous restaurants, shops and other services in the town that serves as the headquarters for many of Cecil County’s top businesses.